The beginning of round one started slow but Liddell picked up the pace in 1:30. Liddell brought Silva to the cage and Silva fought back with a hard combo. Liddell used a left hook and a few more with Silva still standing. The crowd was excited with the exchanges from the Ultimate Fighting Championship fighters. Silva was pissed from round one and landed a shot early on. He look a little more comfortable and gave a left hook. Quickly another hook was exchanged and the direction of the fight changed. Liddell used an elbow over the eyebrow and cut Silva. They both felt they needed to pick up the pace and stand their ground. Liddell used a straight right and rocked Silva. The momentum was strong but changed from each fighter. The crowd really enjoyed the exchanges. Chuck was able to mat Silva during the beginning of the round. This was short lived as they both stood back up on their feed. Liddell directed Silva back to the fence. He was fierce and took control of the round in close contact connected with several strikes. Liddell had a decrease in energy and tried to regain his energy. Chuck took down Silva with 20 seconds remaining in the third round. In the second round St. Pierre took Hughes down within 30 seconds. At 1:45 remaining St. Pierre went for side control and then a full mount. Hughes quickly removed himself from control and they both returned to their feet. Again, St. Pierre went for side control. To end the round and UFC fight with 10 seconds remaining St. Pierre used a kimura and then an armbar to become the winner. Call 702-505-6988 for VIP Las Vegas luxury homes search by a Las Vegas REALTOR. 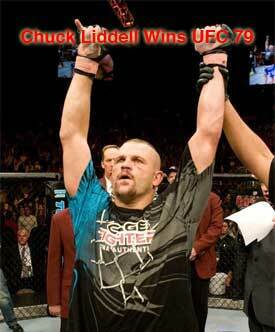 UFC 79 NEMESIS Chuck Liddell is winner over Silva by unanimous decision.